Honoree Eddie Murphy poses on the red carpet during the 18th Annual Mark Twain Prize For Humor at The John F. Kennedy Center for Performing Arts on October 18, 2015 in Washington, DC. 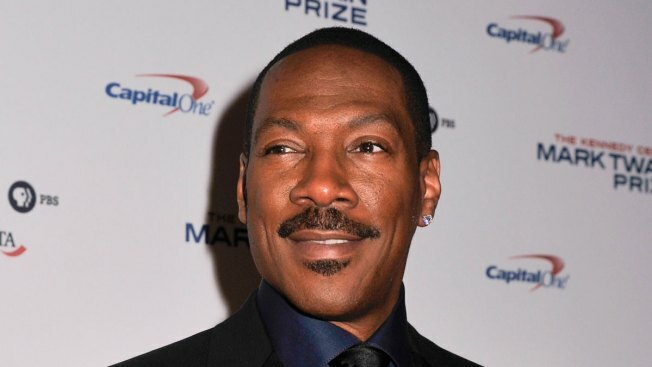 While being honored with the Mark Twain Prize for American Humor at the Kennedy Center on Sunday evening, Eddie Murphy did his first stand-up set in 28 years and used his very first joke to poke fun at Bill Cosby, who was previously given the honor in 2009. "Who else has one of these?" He asked the audience. "Oh! Bill has one of these. Did you all make him give it back?" he asked. "You know you f----d up when they want you to give your trophy back." He began a hilarious impression of Cosby, "I would like to talk to some of the people who feel like I should give back some of my [expletive] trophies!" PHOTOS: Eddie Murphy the movie star! "You may have heard recently that I allegedly put the pill in the people's stomach," he continued the impersonation. "If I ever see or meet this Hannibal Buress in person I am going to try and kill this man!" Buress put the Cosby allegations back in the spotlight after discussing them during a stand-up in 2014. Since then, nearly 50 women have come out and accused Cosby of sexual assault. Murphy has apparently changed his demeanor about Cosby since earlier this year. In February, he was asked to play the controversial comedian for a skit for "Saturday Night Live's" 40th anniversary special but refused to do so. "It's horrible," Murphy told the Washington Post at the time. "There's nothing funny about it. If you get up there and you crack jokes about him, you're just hurting people. You're hurting him. You're hurting his accusers. I was like, 'Hey, I'm coming back to 'SNL' for the anniversary, I'm not turning my moment on the show into this other thing.'" The Mark Twain humor award honors those who influence society in the tradition of Samuel Clemens--the writer and satirist known as Mark Twain. Past honorees include Jay Leno, Tina Fey, Whoopi Goldberg, Ellen DeGeneres and Will Ferrell.